8am-outside air temperature – 83 degrees, warming to 90 degrees by 10am. A calm, gentle east wind, 84-degree water temperature with flat seas, a mild north current and visibility of 60-plus feet on the reef. Crew-Robin Berg, Fransisco Loffredi, Ken Udell and myself. This was the designated day to scout for spiny lobster before mini-season which starts in two days. The twist was the @chiefycrew was being featured in a TV series titled One Breath. The TV show will follow Fransisco as he travels the world in search of locations to dive. He is a world class champion spearfisherman and Cressi dive gear ambassador. He’s been on my boat many times showcasing his freediving and hunting abilities. When he asked to highlight lobster mini-season in the Greater Fort Lauderdale area, I knew it would be a great adventure. 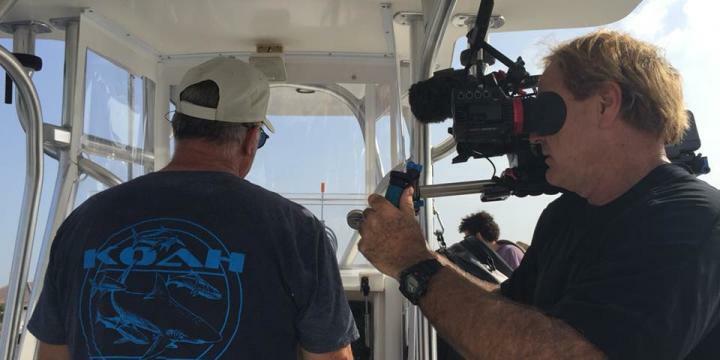 Videographer Robin Berg is no stranger to underwater filming, having been Sheri Daye’s producer for her Outdoor Channel Speargun Hunter series. The primary mission today was to get some underwater footage of spiny lobster and diving off my boat. It also worked well to scout the area we were going to dive on the first day of mini-season this Wednesday. We dove a little patch reef north of the Deerfield Beach International Fishing pier in 40 feet of water. This is an area we have consistently targeted for mini-season and it’s been productive in the past. Under the watchful eye of the camera and even a drone, we plunged in and found some lobster. We didn’t catch any lobster, just getting footage of us looking for them. Fransisco was freediving and we were scuba diving. There wasn’t a lot of spiny lobster but enough to get the underwater footage Robin needed. Secretly, I was concerned this area was going to produce enough lobster for our double limit for mini-season on Wednesday. But I remembered, lobsters have legs and they move around. We got back to the dock in the afternoon, and I had my fingers crossed we would find a lot of lobster in that same area in less than two days.